I came out of a drunken blackout on the steps of a dark warehouse, not remembering anything but rum and tongues sliding down my throat. A Colombian man passed me a joint, and I took a puff, looking around. The streets, hours ago filled with thousands of people, now were filled only with empty beer cans, ribbons and trash. It was the carnage of Carnaval de Barranquilla in Colombia, second only to Rio in its wild expression of pre-Lent festivities. And the main event hadn’t even started yet. When I and five other gringos arrived that afternoon, the whole city was alive with colour and costume. Locals wore homemade T-shirts splattered with sequins, ribbons and paint. Women and girls were dressed like the negrita puloy, the “little black girl” mascot with spiral curls, bright red lips and red polka-dotted dress. Our group settled into a private residence, because every hostel and hotel in town was full. We went for a walk and soon heard warbled Latin music blasting into the street from the corner market. A lively crowd sat on the patio at plastic tables, drinking and singing along. We joined in, grabbing the one remaining table. I felt the drips of condensation rolling off my cold beer, onto my calves. I heard the shuffle of dominoes, the coos of Colombians crooning Marc Antony, the claps to the Latin rhythms that we gringos can never quite get. I watched the rainbow of triangle flags above us palpitate with the cool breeze bringing evening. I smelled the charcoal and grease from chicken burgers grilling on the street cart nearby. After covering our bright-red table with empty beer bottles, we walked back to the house, where we polished off a pipón, the mid-sized bottle of Medellín Rum. We then mixed more rum and Coke into plastic to-go bottles and went to join a massive street party, where thousands of locals and tourists were crammed together, sweating and drinking and dancing. Within minutes, the members of our group sifted off like puffs of flour getting kneaded into the sticky dough of Colombian Carnaval. And that is how I ended up on the steps of the warehouse, with no idea where I was or where my home base was. I wandered the dark streets until two cops stopped me, and, while I feared they might mess with me, they were kind. They hailed a cab which drove me around in circles until I miraculously recognized the rainbow flags from earlier that day. Everything goes at the parade. I awoke to the sound of telenovelas, Spanish soap operas, blaring in the adjacent room. Hungover gringos sprawled like sea lions. Two were naked on a pile of couch cushions on the floor. My friends Gina and Natalie laid on a bed together, covering their heads with pillows. Our other friend Ariceli was spread eagle and drenched, for some reason. More gringos whom we didn’t know stepped over our things to make a line for the one shared bathroom. I exhaled and laid back down, surrendering to the craziness. It was parade day, the real start to Carnaval, and things were about to get a lot crazier. The parade was about to begin. Gina, Natalie and I shoulder-squeezed our way along the packed sidewalk, through the glitter-dusted, black-painted, foam-spraying, hip-bumping, champeta-dancing, rum-drinking, loud-laughing, falling-over crowd. To our left, there was an endless line of vendors grilling meats, and to our right, the backs of tall bleachers blocking the view to the parade. We walked for a long time without finding an opening, and, hearing that the parade had begun, we decided to approach one of the many scalpers who had been trying to sell us tickets all along. A thick, short Colombian man held out a fan of tickets. We engaged in the standard haggle hoopla. First, the seller attempts to extort your ignorance, quoting a price three times higher than what a local might pay. (In this case, 60,000 Colombian pesos, which, in 2014, was about US$30 for one ticket.) When you refuse, he or she then moves on to your sympathy. “That is the lowest I can do to make a profit for my family,” he told us. But this didn’t work for three young gringas who would rather spend their 30 dollars on 30 beers. 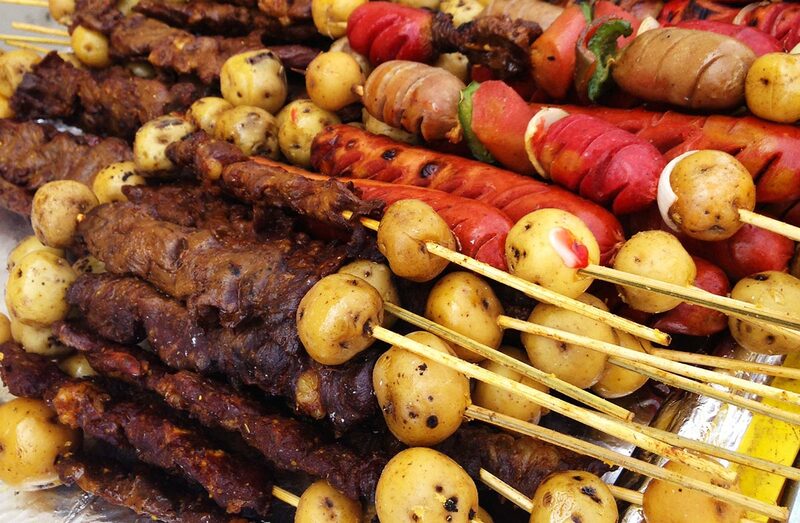 Wouldn’t be a street party without street meat. Ultimately, we got tickets for 15 bucks, half the original price, and we rushed over to an entrance where we showed a cop our tickets. He let us pass into an area packed with other neck-stretching people trying to catch a glimpse of the glitter and glam. Since our seats were on the other side of the street, we pushed toward the metal rails that contained the herd. “Perdón, perdón,” we said as we pushed through the crowd. Excuse me, excuse me. A petite woman with orange-bleached hair, black-painted eyebrows and a sequined red hat elbowed me hard in the side. “You can’t push in front of us,” she said. We had been conned. The scalper surely knew what we did not, that the tickets were useless once the parade had begun. A couple of negritas puloys posing for the camera. I ducked down and burrowed through people toward the rail, where I popped out like a meerkat and tapped a tall police officer on the shoulder. We stomped behind Officer Pérez in a little lynch mob searching for the con man. Pérez stopped to question various scalpers, who shifted uneasily. But, in the end, we never found the guy and were out our collective 45 dollars, or 45 beers—the more valuable of Carnaval currencies. “Come with me,” Pérez said, striding back toward the crowd we first found him in. He ushered us in front of him, holding his long arms out to the sides to protect us from jabs and shoves. We passed Eyebrows, and I looked back at her with a smug smile. No one allowed to cross, eh? I figured Pérez was going to walk us across the street once there was a lull in the parade, but, instead, he pulled open the rail and led us to a front-row spot where only medics, officers and important-looking people were allowed. He introduced us to a woman I imagined was the mayor of Barranqilla, in her red suit with matching red lipstick and tight bun. She smiled and welcomed us to her city. 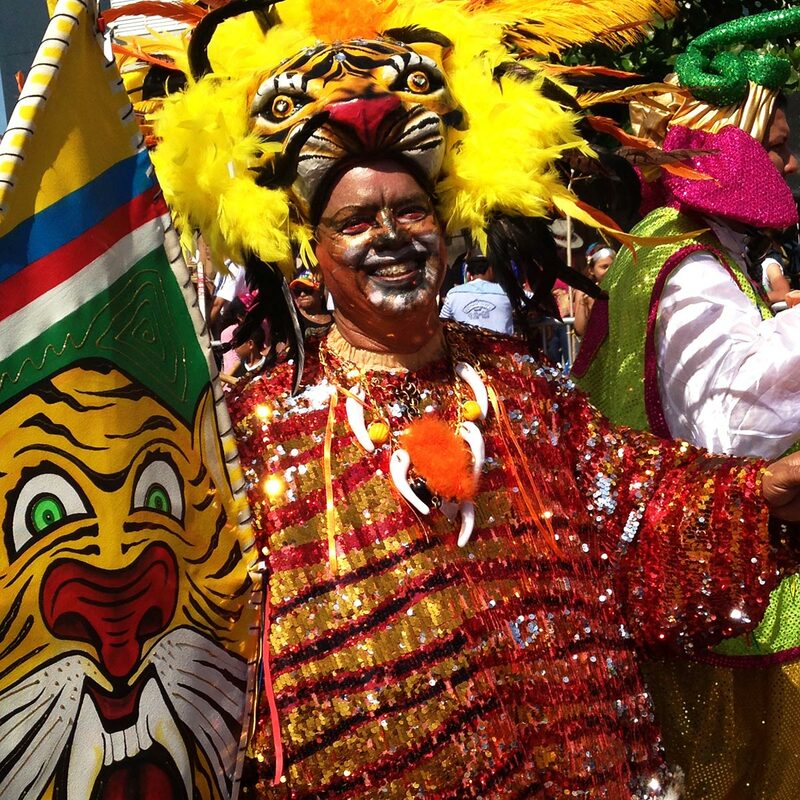 Tiger costumes are popular in the South American carnivals. “You can stand here,” Officer Pérez said. We all giggled with excitement. We could not get any closer to the action. 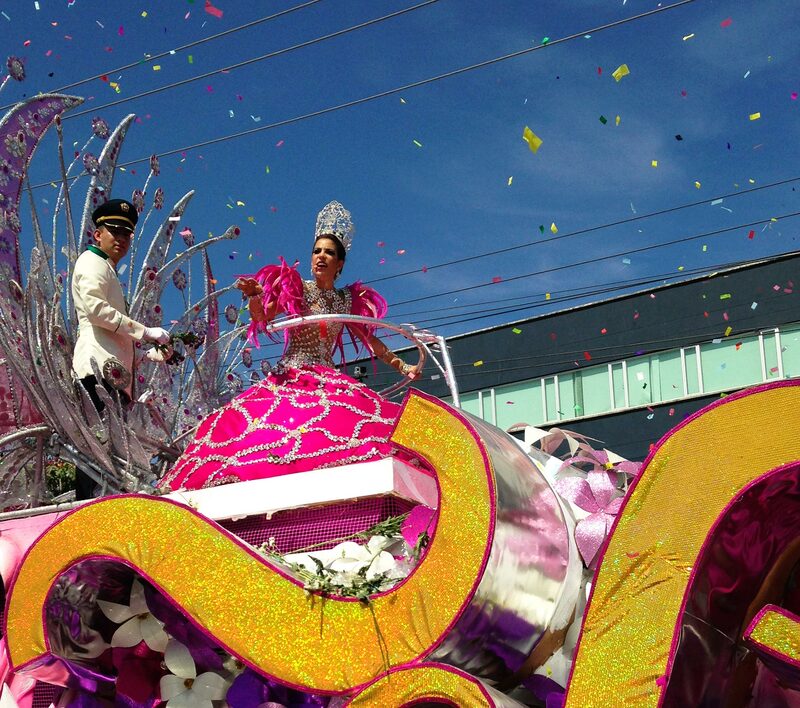 A 20-foot-high, flower-covered float with pink confetti bits glided by with a Colombian woman dressed in a puffy pink ball gown, like Glenda the Good Witch. 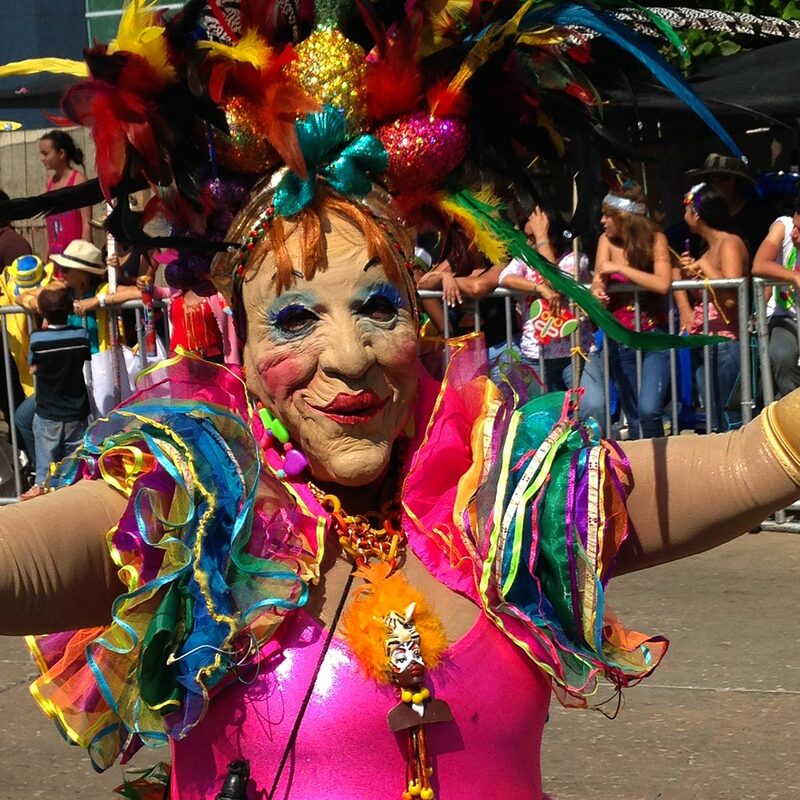 “That’s the Carnaval queen,” Mayor Red Suit leaned in to tell me. A painted pride of lions came running and roaring, leaning in to growl at us, clawing and posing for pictures in front of Gina’s Canon camera. Creamy-skinned Colombian women spun in their sparkling Cinderella skirts. Fedora-wearing men drank from plastic cups and sweated out the alcohol. Drag queens in sequined gowns and feathered headdresses swiveled their hips. Skinny boys in white linen and sombreros banged their cow-skin drums. Egyptian pharaohs and their Cleopatras shone gold in the hot sun. A band of gorillas squatted and screamed. Famous Colombian musicians floated by singing, as people behind us squealed with excitement for the local celebrities. Painted negrita puloys with fruit piled high on their scarved heads curtsied. Nearly naked, big-breasted garotas shook their thick booties and tail feathers. Señoras in white and red multi-tiered dresses with flowers tucked behind their ears smiled and proved that wrinkles can be beautiful. It was all too much, too brilliant, too goosebump-giving to bear. Erin Zelinka is a freelance writer, communications specialist and author of The Disconnect: Quitting My Addiction to Media and Affirmation. She has travelled to more than 30 countries and has lived in Colombia, Peru, Australia and Portugal.